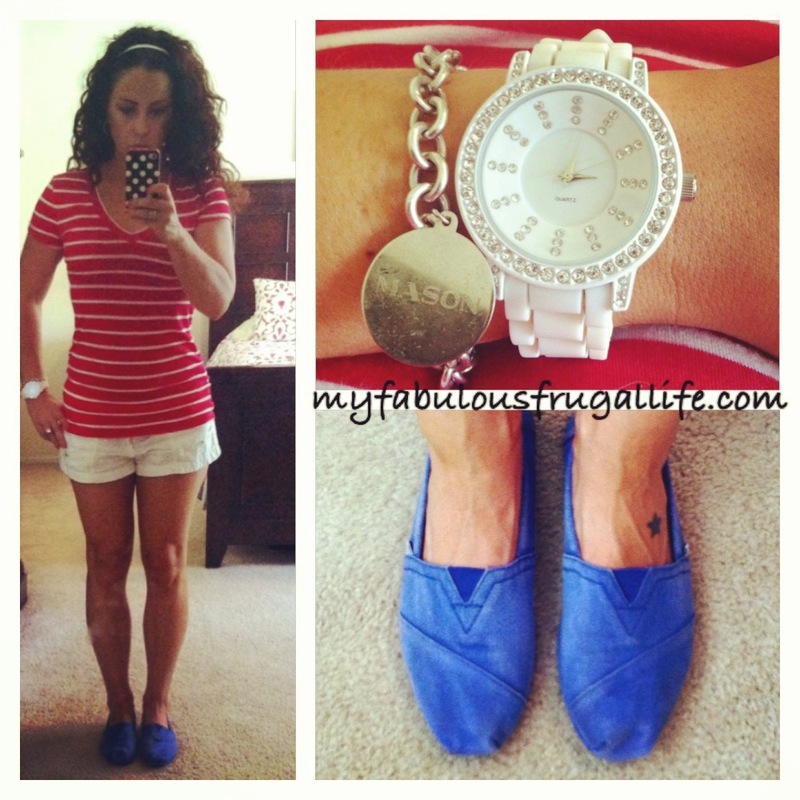 Today’s outfit is a casual option for the Fourth of July or a weekend look. Red, white, and blue will always be a winning look in my book! Red and White Striped T-Shirt $5.99 from Ross. I love the fit of this t-shirt! It is fitted without being tight and the length is perfect, I don’t do cropped tops! White Linen Shorts from American Eagle. I have had these shorts for so long, I’m really not sure when I bought them or what I paid for them. I was talking with a friend the other day about shopping and we both agreed that AE is a great place to buy shorts. I find that the fit and length of their shorts is fabulous! We are both petite so maybe this is only the case for us short girls! Blue Toms Shoes $15 Ebay. I bought these bundled with my white and silver Aztec Toms, last seen here, for $30 total. This is a great deal because one new pair of Toms retails for $49 or more! I think of Ebay as an online thrift store. Refine your searches for used items, you will be amazed at the awesome deals you can find! White Rhinestone Boyfriend Watch fabulous Target clearance find last fall. I believe I paid $9! If you are having a casual Fourth of July BBQ this would be a great look! Gorgeous watch! I can’t believe the price, looks like it costs 100 times more. Thanks! I couldn’t believe my good fortune when I found it on the clearance rack!